26 November 2018 Extreme Cold Weather Gear Issue! Submitted by Mike Penn on 24 November 2018. Today we went to the United States Antarctic Program's facilities here in Christchurch to be sized and be issued our Extreme Cold Weather (ECW) gear. We also made our final check-in (pronounced "Chicken" by the New Zealanders working in the CDC) of our bags. We had to designate "Checked", "Carry on" and "Boomerang" bags. 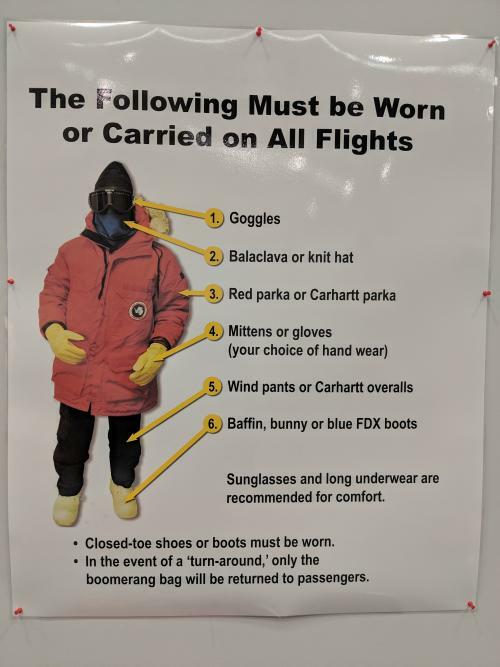 We are required to be dressed in our full ECW kit for any flight that is going to, from or on Antarctica. 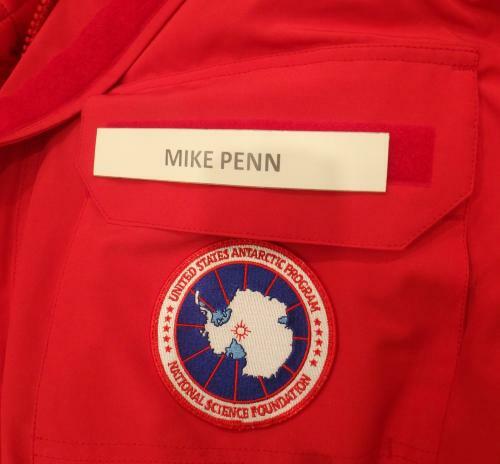 Every USAP participant is issued "Big Red" (Parka) among all of their Extreme Cold Weather gear. ECW gear is required on all Antarctic flights. What is a Boomerang Bag? The weather in Antarctica can be severe and unpredictable. 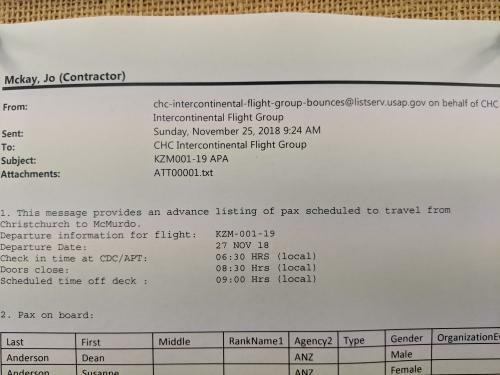 Occasionally an airplane can leave here bound for McMurdo Station only to learn that the conditions have deteriorated below safe landing conditions and the airplane will have to turn around and fly back to Christchurch, New Zealand. Just like a boomerang will fly back to where it was thrown. Every bag must be properly packed, weighed and labeled for the "Ice Flight". Those of us going to the South Pole were issued a medicine called Diamox to help with the symptoms of Acute Mountain Sickness, (also known as Altitude Sickness). Since the South Pole is at about 9300 feet of elevation, and because of the cold, it has a Physio-altitude of about 11,500 feet, altitude sickness is common when people first get to the pole. While normally altitude sickness is mild and temporary, it can actually be deadly. We were given a briefing on how to identify the severity of the symptoms, how to avoid the worst effects and what to do if we see the symptoms in ourselves or our team members. High altitudes can have very serious impacts on the human body. 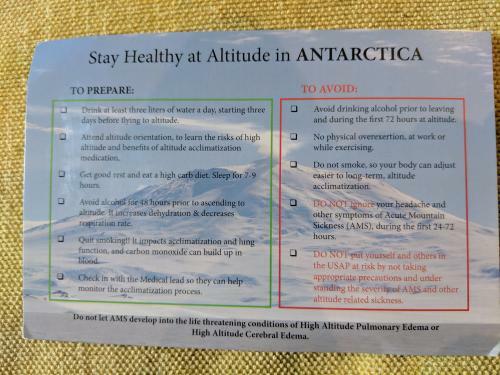 This chart (and a briefing) were given to those of us going to the South Pole and the area of high elevation. 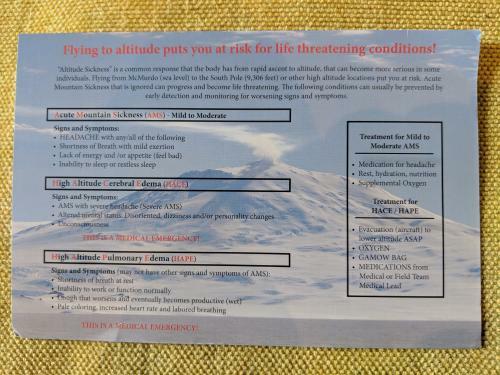 Preventing altitude sickness could save you a lot of discomfort and could even save your life! Our "Ice Flight" is scheduled for tomorrow morning. There is a possibility for a delay due to some wind concerns, but it looks like we will leave tomorrow morning. Ready or not, Here we go! Our Ice Flight is scheduled for 0630 27 November. Was it weird to fly into a different day cause you are doing it for the first time also that you lose a day and then when you come back you gain a day do you think it will be weird coming back into another day. Adrianna, It was weird! Now that I've been here in Antarctica (McMurdo Station) and was in Christchurch for a few days, the hard part is trying to remember what day and time it is back home where you are. As I am typing this, it is just about noon (1200) here but for you back home it is 6:00 PM (1800)...YESTERDAY. Did you hear any talk about using "Dex" for high altitude? Kevin, I haven't heard anything about Dexamethasone. We were told that our physicians from home could prescribe us anything they saw fit, but that we could/would be issued Diamox here. I actually received mine in Christchurch. They mentioned it again in one of the training sessions I attended today. I know the altitude affects everyone differently. I'm hoping that I won't have much of a problem. I'm trying to do everything I can to mitigate it. I'm in decent shape, I'm trying to get plenty of rest and drink a LOT! Madi, Thank you for reading my journals and taking the time to say an encouraging word. I really appreciate it! what food is available in antartica? I heard that you dont hunt, so do you pack all your own food in? Morgan, all of our food is provided so other than pick it up at the galley, we don't have to really worry about that when we are here in the station. When we are out at field camp there is usually a kitchen tent and a cook! Morgan, We don't have to hunt and there really isn't anything to hunt anyway once you get off of the coast. They provide food for us. If we are just out for the day, we will pack some in, but in general in camp or in station, the food here is surprisingly good! As you probably know, your body needs more food to burn just to keep you warm when it is really cold. So, most of the food here is designed to provide more calories than a similar cafeteria back home. The biggest difference between here and there is that here there generally aren't any "Freshies." Any fresh fruits and vegetables are rare and valuable around here. Also, all of the beverages are...reconstituted. The milk has been powered, shipped here, then the powder was mixed with the correct amount of water and made into milk again...mostly. The beverages have been a challenge to get used to. I'll write more about this in a journal in the near future. Mesa, Your question has been a popular one! I'd have to say that the ice auger is the most interesting piece of equipment. Please read some of my other responses for the answer to this question. Thanks for reading my journals and taking the time to ask a question! This is one of kevin's students, how heavy is the suit you wear and do you ever get hot in it? Austin, Your question has been a popular one! Please read some of my other responses for the answer to this question. Thanks for reading my journals and taking the time to ask a question! what sorts of things did you put in the check bag? Lilly, the checked bag was everything that we wouldn't need until we got on the ice. 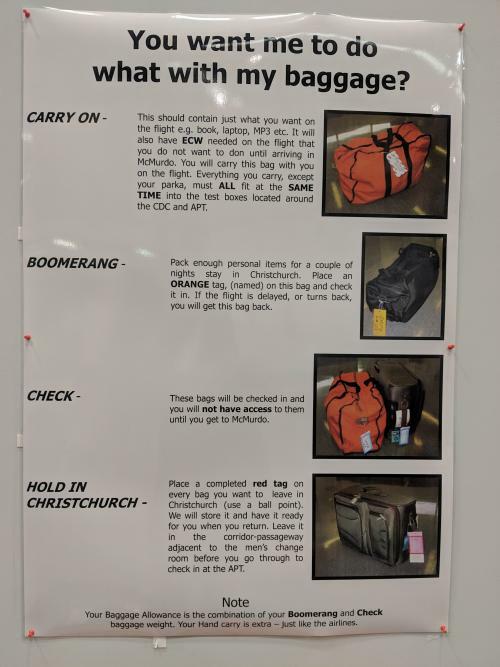 We also packed a "Boomerang" bag that has things we would need if the plane needed to turn around and head back to New Zealand. What happens if someone gets injured while in Antarctica. Your question has been a popular one! Please read some of my other responses for the answer to this question. Thanks for reading my journals and taking the time to ask a question! How do you breath with all that gear on your body? Aside from being a little too warm, it really wasn't that bad. No worries! Hey! My question is why they have you wear all of your stuff on the plane. It makes sense to wear your parka and pants, but wearing everything on the plane must be very uncomfortable. I just think that they could give you some time once you land to put on everything else. I'm in Kevin's class, what material is the parka? Gideon, The "Big Red" parkas are made of goose down and they are extremely warm! hi this is raymond i go to scott my question is why can't penguins fly and what is your favorite veichle that you've rode so far? Raymond, Since penguins eat only fish they are built for swimming rather than flying. The second question is tougher! I enjoyed riding on "Ivan the Terra-Bus" mostly because it is such an iconic symbol of the U.S. Antarctic Program. But I've always enjoyed helicopter rides too. Riding in a PistenBully is cool too! There is a short video of a PistenBully at the end of the video I posted titled "Interesting Things In McMurdo!"